Tapping into both childhood fears and mining a rich social setting proves to be fertile ground in Babak Anvari's psychological terror Under the Shadow. Set in the Iran /Iraq war and using the genre conventions of a haunted house /superstitious myth, it's the story of Shideh (Narges Rashidi) and daughter Dorsa (Avin Manshadi). Shideh has been fighting against the patriarchal society to get back to her studies as a doctor, but losing the fight, she's forced to take control of the household when her doctor husband is posted at a facility near the front line on military service. 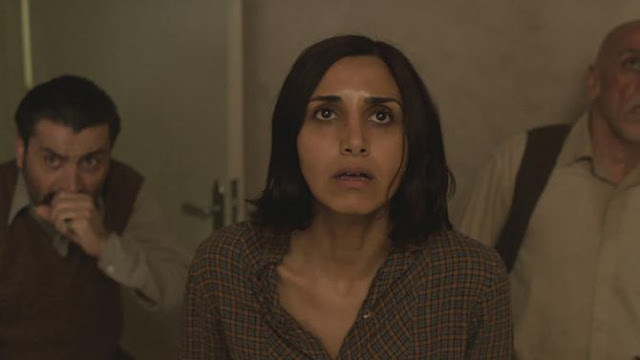 As a first foray into the horror genre, writer / director Babak Anvari's Under The Shadow both simultaneously embraces the tropes of the genre and gives them a new spin, creating something that feels fresh and exciting. The slow burn of the set up allows you to really engage with Shideh's struggle, and then when Dorsa starts to feel threatened, the atmospherics are simply ramped up another notch. (Granted the idea of a kid under threat is perhaps where the film's creepiness really begins to kick in). Anvari's embracing of autobiographical elements has clearly enhanced the look and feel of the film, but it's Rashidi as the feminist hero and first time child actor Manshadi who really propel proceedings into the stratosphere. Their interaction and the sneaking feeling that Shideh is losing it are nicely set up and in the initial part of the film the seesawing between who is right and who is wrong veers so clearly back and forth that you're never quite sure if the Djinn concept is anything other than in both of their heads. Mining the rich vein of paranoia and foreboding with the war in the background and the shredding of nerves works wonders for the audience participation and engagement with Under The Shadow. This is not a CGI driven shock fest, but an introduction of a new take on the genre that feels fresh, exciting and could potentially have legs for others to take over; it feels like even by saying so little, the mythology is deeply set up in this film - and the ending offers up the potential for more. The fact its societal setting says much gives a disquiet and insight that adds much to proceedings. Original, slow burning and psychologically deft, the unsettling Under the Shadow is a clever take on its genre and it's one not to be missed.